TS Overseas Scholarships Online Application form for Fresh Registraitions to SC,ST, BC, Minority Students. Fresh Registraition for Overseas Scholarships (SC,ST,BC,Minority). Minority Chief Minister's Overseas Scholarship Scheme Online Application form, Mahatma Jyothiba Phule BC Overseas Vidya Nidhi Online Application form, SC ST Ambedkar Overseas Vidya Nidhi Online Application form, Telangana SC, ST, BC, MinorityOverseas Scholarships Online Application form Registrations. TS Overseas Scholarships Scheme Fresh Registrations at Telangana Epass Web Portal : telanganaepass.cgg.gov.in. TS Overseas Vidya Nidhi Scheme Online application form/ TS Overseas Study Scholarships Scheme Online application form to SC, ST, BC, Minorty Students, Telangana SC, ST, BC, Minority Students Overseas Scholarships Online application form/TS Foreign Study Scheme scholarships Online application form/ TS Foreign Education Scheme scholarships Online application form: telanganaepass.cgg.gov.in Online application form for fresh registrations of Ambedkar Overseas Vidya Nidhi Scheme for SC & ST Students/ Overseas Study Scheme for MW Students /Mahatma Jyothiba Phule BC Overseas Vidya Nidhi Schemes for BC Students. Note** If the students submitted any false/wrong information the concern individual will be held responsible. Action will be initiated against him/her. Step 3: Directly Click on the below given "TS Overseas Scholarships Links" Page. TS Overseas Scholarships Links. Then, Overseas Scholarship Selection for SC, ST , BC and MINORITY Services Official Page will be shown. In this page, follow the below given instructions.. Note: Please Provide Valid SB(Savings Bank) account. As Scholarship Account/Jan Dhan Yojana Account will not accept such big amounts. Caste Certificate Details: Fill the following study details in this section. Size: not more than 100KB ,Format:*.jpg,*.JPG . TAGs: TS Overseas Scholarships Online Application form for Fresh Registraitions to SC,ST, BC, Minority Students. Fresh Registraition for Overseas Scholarships (SC,ST,BC,Minority). 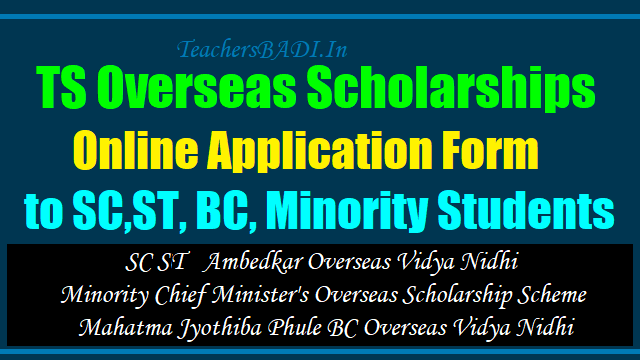 Minority Chief Minister's Overseas Scholarship Scheme Online Application form, Mahatma Jyothiba Phule BC Overseas Vidya Nidhi Online Application form, SC ST Ambedkar Overseas Vidya Nidhi Online Application form, Telangana SC, ST, BC, MinorityOverseas Scholarships Online Application form Registrations. TS Overseas Scholarships Scheme Fresh Registrations at Telangana Epass Web Portal : telanganaepass.cgg.gov.in. TS Overseas Vidya Nidhi Scheme Online application form/ TS Overseas Study Scholarships Scheme Online application form to SC, ST, BC, Minorty Students, Telangana SC, ST, BC, Minority Students Overseas Scholarships Online application form/TS Foreign Study Scheme scholarships Online application form/ TS Foreign Education Scheme scholarships Online application form: telanganaepass.cgg.gov.in Online application form for fresh registrations of Ambedkar Overseas Vidya Nidhi Scheme for SC & ST Students/ Overseas Study Scheme for MW Students /Mahatma Jyothiba Phule BC Overseas Vidya Nidhi Schemes for BC Students.